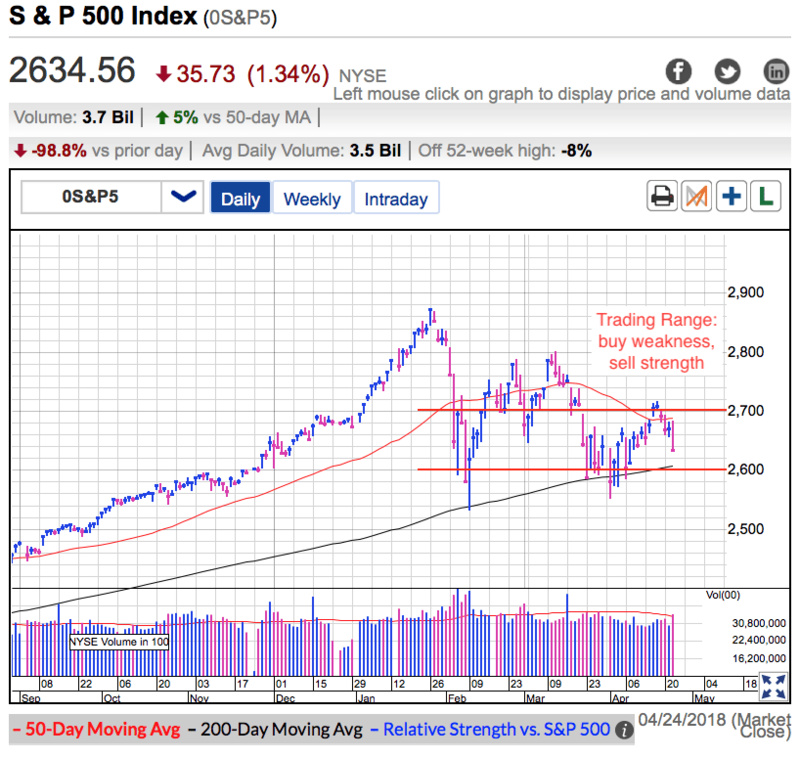 On Thursday the S&P500 surged higher, extending Wednesday’s bounce off of 2,600 support and the 200dma. Markets sold-off Tuesday on fears of 3% Treasuries, but that nervousness and uncertainty evaporated as the focus returned to earnings. So far Facebook and Amazon knocked the ball out of the park and that strength is putting investors at ease. Predicting the market isn’t hard if you know what to look for because the same thing keeps happening over and over. But just because we know what is going to happen doesn’t make trading easy. Far and away the hardest part is getting the timing right. That is where experience and confidence comes in. Several months ago investors were begging for a pullback so they could jump aboard this raging bull market. But now that prices dipped, rather than embrace the discounts, these same people are running scared. Markets dip and bounce all the time, but we only make money if we time our trades well. The most important thing to remember is risk is a function of height. The higher we are, the greater the risks. By that measure, Tuesday’s dip near the 2018 lows was actually one of the safest times to buy stocks this year. Did it feel that way? Of course not. But that is why most people lose money in the stock market. If most people were selling Tuesday, and most people lose money, then shouldn’t we have been buying? Given the market’s reaction today, the answer is a pretty resounding yes. The point of this post isn’t to brag about the calls I made, but letting people know it is possible to read the market and make money from these swings if they learn to look at the right things and ignore all the other noise around them. And this doesn’t just apply to this week’s move. In January I warned readers the relentless climb higher was unsustainable and incredibly risky. Just when the crowd was feeling the most confident, February turned into a bloodbath. But what most people failed to realize is that dip was actually the safest time to be buyings stocks because prices were dramatically lower. It is always safer to buy when fear and uncertainty are peaking than when everyone is calm and confident. This year, far and away the riskiest time to own stocks was in January when everyone was confident and the safest was to buy when everyone was scared in February. Then we come to what happened since. I told readers the selloff did enough damage that we shouldn’t expect a rebound back to the highs. Instead, look for a sideways consolidation and a trading range to develop. In a trading range we buy weakness and sell strength because every directional move fizzles and reverses. And what has happened since February? Every directional move fizzled and reversed. While it is easy to identify a trading range when looking at an old chart, these things also easy to spot in real-time. Unfortunately most people miss it because their judgement is clouded with bullish or bearish biases. They assume every move the higher or lower is the start of the next big move. But just when everyone is convinced the rally is back on, or the selloff is about to get worse, the move fizzles and reverses. I don’t have a crystal ball, but I have been doing this long enough to recognize these patters and profit from them as they happen. If you learn what to look for, you can do it too. If you found this post useful, return the favor by sharing it on Twitter, Reddit, Facebook, and everywhere else traders gather. Volatility came roaring back Tuesday as the S&P500 plunged 1.3%. The most noteworthy headline was 10-year Treasuries topping 3% for the first time in several years. Rising interest rates are one of those half-full, half-empty things. Interest rates are recovering to more normal levels as we finally put last decade’s financial crisis behind us. But a big portion of the stock market’s strength comes from high valuations due to ultra low-interest rates. Stocks and bonds compete for investment dollars and when bond returns were laughable, a lot of bond investors turned to equities for better returns. But now that bonds are becoming more attractive, some of that money is flowing back into bonds. The thing to remember about today’s 3% headline is bond prices have been rising since Trump’s election. For practical purposes, 3% is no more significant than 2.9% or 3.1%. The round number simply makes for a better headline. Will 3% change anything, probably not. If the market didn’t care about 2.5%, 2.7%, or 2.9%, then 3% won’t matter either. This market has been incredibly resilient because confident owners refused to sell every bearish headline thrown at it over the last three months. Will this time be different? Not likely. The thing to remember about market crashes is they are brutally quick. We’ve been trading sideways since February’s selloff. That is in the face of relentless bearish headlines. If this market was going to crash, there have been more than enough excuses to send us tumbling a long time ago. Instead of selling these bearish headlines, confident owners are holding for higher prices. When owners don’t sell bad news, it stops mattering. That is what happened over the last 90 days and it is what is going to happen here. If the market is in a trading range, should we be buying this weakness or selling it? Most people lose money in the stock market because they buy when they feel safe and they sell when they get nervous. Obviously buying high and selling low is a horrible strategy. What we really want to do is buy low and sell high. But that is a lot easier to say than it is to do. That means we need to zig when everyone else zags. That means buying when everyone else is selling. The best trades are often the hardest to make. Everyone’s favorite FAANG stocks got hammered today. But this isn’t a surprise. 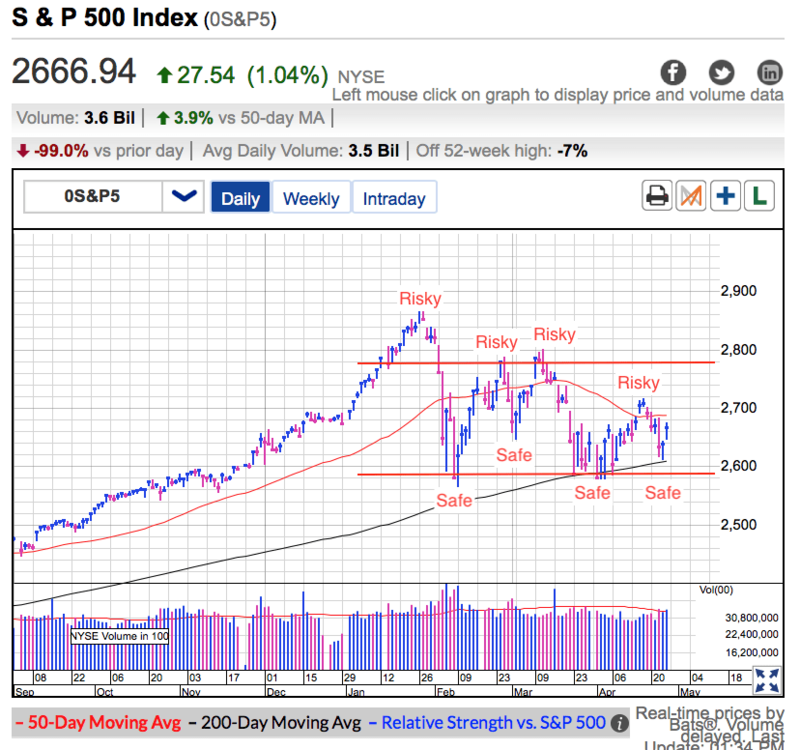 These highfliers magnify the market’s move in both directions. They go higher than everything else, but that also means they get hit the hardest on bad days too. Weeks ago people were begging for a pullback so they could get in. The market answered their prayers. The question is if any of those people have the courage to buy. While we could see a little more near-term weakness, months from now people will be kicking themselves for not buying more at these levels. If you found this post useful, share it with your friends and colleagues!